42-year-old Sarudzai Ganyiwa who was married to Edmore Chitauro (48) was reportedly caught red-handed playing the "hide my sausage game" with her husband's father, Simon Chitauro, aged 65, two weeks ago. When reached for comment, police spokesperson for Mashonaland West Province, Inspector Clemence Mabgweazara confirmed Sarudzai Ganyiwa's death and said she had consumed poison to end her life. "The case of a woman who died in Nyamweda area in Mhondoro after consuming poison, was reported at our Nyamweda police base. She reportedly committed suicide after being caught sleeping with her father-in-law in the bush. As police, we say, come what may, people should engage in talks to reach a common ground, not to think of committing suicide whenever something goes wrong," said Insp Mabgweazara. Meanwhile, village head Chitauro is denying being caught feasting on his daughter-in-law's "honey jar". This is despite his confirmation that he also contributed towards compensating his son's in-laws over the alleged matter. "My young brother, Lucious, is the one who first saw the two walking towards the Gumtree plantation area where he followed and caught them in the act before rushing to alert our mother, Charity Mudarikwa. When our mother arrived at the scene, she found the two lying together, stark Unclad. However the daughter-in-law managed to flee. I was really pained by this incident. I then notified my brother Edmore, who is the husband of the cheating woman, that his wife had been caught having s_ex with our father, her father-in-law. A number of people knew about the two seeing each other, but no one had enough guts to confront him," said Isiah, a son to the said 'se_xful' village head. He added that while their father was herding their cattle in the bush, Sarudzai would at times go with food to her father-in-law after which the 65-year-old lover of things would let loose his 'anaconda' and feast on Sarudzai's forbidden fruit as 'desert'. "After the incident, Sarudzai later went to our father's homestead, where she was heavily insulted by our family members who labelled her a shameless woman. She was then chucked out of the homestead. Unfortunately, she consumed some poisonous substance and died three days later. The trouble causer (our father) is also the village head, so we don't know how to handle the matter now. It's now very risky to leave our wives in the village when we have such a predator amongst us," he said. After being caught poking his daughter-in-law's 'southern hemisphere tunnel' with his red-headed 'joystick', the village head is said to have offered to compensate his wife with a cow before begging her not to tell any outsider about the shameful incident. "We have been married for 26 years with my wife. We were even united in holy matrimony in church by our pastor. I'm a cattle dipper, and I'm always busy with my work, so my father took advantage of that and the two fell in love. What used to surprise me is that I used to find used cond_oms in my garden. I want my father to compensate me for what he did to me. When they got caught in the act, I didn't ask my wife about it, however, I went to inform her grandmother about it, but she refused to come and talk to my family about the issue," he said. "This is not the first time that my father has been caught 'crack-filling' a married woman's "se_xual valve" with his bedroom gun. He was evicted from Mugari area amid allegations that he forced women to have s_ex with him first before he could hand out food donations to them from donors. After my wife drank poison, just before she breathed her last, she confessed that she had been cheating on me for some time with my father," Edmore added. Interestingly, the village head's official wife, a mother to Edmore, however denied that her husband had been caught "servicing" his daughter-in-law's "s_exual tunnel". "The talk is doing rounds, but there is no evidence! Yes I went to the bush, but I caught my husband putting on his pair of trousers. I didn't bother to ask him what he was up to. It's a lie that I insulted my son's wife. 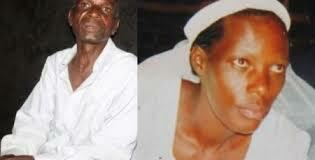 I only confronted my husband later on and he responded impolitely," said the 62-year-old woman. Simon also denied being caught playing the adult's "see-saw up-and-down game" with his son's wife. "They are saying I was caught sleeping with my daughter-in-law. But to me these are lies. They just want to take over my post as village head, that's all. It's true that I also paid a cow that was used to compensate my son's in-laws. It's not because I was feasting on my daughter-in-law. When this matter has been settled, we will sit down as a family then I hand over the village head manship to them. Sarudzai's father, 86-year-old Sekuru Moses Utete, said he demanded a compensation from his son-in-law because they did not go to the hospital to check on Sarudzai after she consumed poison. He is said to have demanded four cows and goats. "What my daughter's father-in-law did was very bad. So it means my daughter had two husbands," said Sekuru Utete.